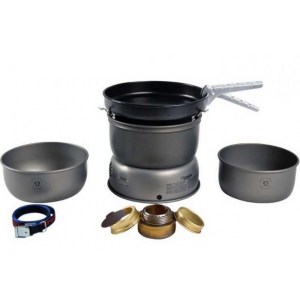 A lightweight, easy-to-make, reliable, compact stove. 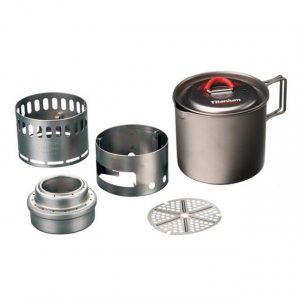 A lightweight, easy-to-make, reliable, compact stove. Does it get better than that? It is easy to use, easy to light, and will boil water. The shape of the bottom of a beverage can gives the stove great stiffness and structure making it durable. If I am going out in the backcountry, this type of stove has everything that I want. Fuel is cheap, light, and easy to find in U.S. Uh, I guess the fact that you have to make it yourself would be a con for some people? Fuel is cheap and lightweight. The stove is very easy to make. It is safe and smoke free. It brings water to a boil quickly. Without burner adjustment, a pot stand/windshield that can hold the pot at a few different heights is preferred to control the cook rate. I use a soup can that is bigger than my pot with holes and a wire (U-shape) to hold the pot at different heights above the stove. I can also turn the can over (on top of the stove) to grille. 1 oz of 93% pure alcohol can boil 20-24 oz of water easily. The windscreen/pot holder makes the whole system very stable. Hi All: I was told about the zen stove idea about a year ago and decided to try making one. I've made 5-7 of both types, but have not used the cat food can on a trip yet. That is because I'm so happy with the pepsi can variety. The only real change that I've made is a pot support out of light guage 3"X3" or so fence mesh mounted on 4-1/2" square piece of the thinnest 3 ply plywood that I could find. Wires at bottom are put thru holes in plywood and bent over, inner part of mesh is carefully bent in so that stove can't slide around, top wires are bent over and in and left 1" long as pot supports. The profile resembles an hourglass. One side is left open enough to insert simmer ring. 5"+ pots work great and stove and simmer ring and snuffer and 5cc syringe (for removing any unused fuel) all fit in the 1.5 liter or so pot with no trouble. My best home made wind screen is made from the left over Guinness cans stapled together and carried around the outside of the pot and held in place with rubberbands. We've probably cooked several hundred meals on the first stove with no signs of deteriorization. I used the plywood base for sound footing on sand and snow; it works well and is worth the 1-2oz it adds. The whole set weighs less than 8oz. My next variation will be a 1" or so hole in the center of the plywood to preheat the stove. That's a trick that I just read about here on this site. I make my own pepsi can stove using the zenstoves.net templates. I have been asking myself why I didn't use these stove before? They are so cheap, the first one probably cost $5, the next 5 stoves absolutely nothing (if you enjoy the handwork involved, cans are recycled). I can purchase the food I need at any Walmart. Most of my cooking involves boiling one or two cups of water. These stoves are great for this task. I use an open jet sideburner design with no pot stand. 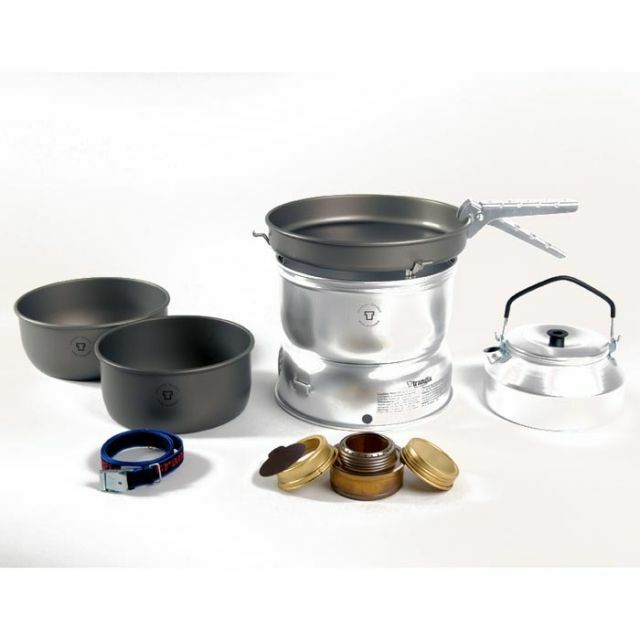 The cookset is a GSI Soloist or an 1.4L Evernew titanium non stick pot and pan. I guess my most difficult situation with this stove is cooking pancakes since these stoves are always burning at full power. 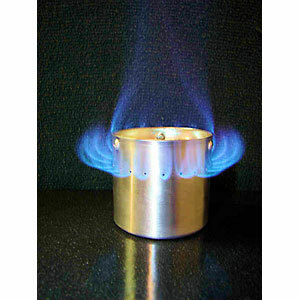 I am shocked that there is no review on the site for DIY beverage can stoves. So, I thought I would put this in here both as a testimonial and to encourage discussion. I've made a handful of beverage can stoves and I've never run into the tiniest issue with them. They weigh nothing, are durable, almost free, and fuel (denatured alcohol, or whatever firewater-everclear-moonshine is local) is relatively clean and easy to acquire anywhere in the world. Use tent stakes and a piece of foil for a wind screen and all is good. The standard Pepsi-based design has served me for quite long periods (months) and has *never*, *ever*, failed me. By way of example, one dose of fuel is usually enough to cook a pot of dried lentils and rice, and more than enough for pre-cooked or freeze-dried products. After much experience and thought on the matter I don't believe I shall ever buy a brand name, lightweight hiking stove. For around $10 one can assemble a few of these and have less on your mind where material value is concerned. Used with a sealable MSR pot. 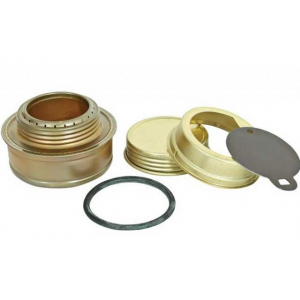 The MYOG Beverage Can Alcohol Stove is not available from the stores we monitor.